Super-cute and cheap to boot, this DIY jar kitchen garden is a cool, yet practical way to grow and style your kitchen herbs. Learn exactly how to make it with this three-step video or follow the steps below.... Drought-friendly herbs like lavender, sage, and thyme are recommended for growing in mason jars in case of mis-watering, but you can grow virtually any herb in a mason jar, so long as you’re not starting them off from seeds. Keep a pinch of fresh herbs for delicious meals just a few steps from the kitchen and all in one place–a strawberry jar. Originally designed as a novel way to grow clean strawberries, the pockets in a good-sized jar are big enough to hold an herb plant.... Drought-friendly herbs like lavender, sage, and thyme are recommended for growing in mason jars in case of mis-watering, but you can grow virtually any herb in a mason jar, so long as you’re not starting them off from seeds. Super-cute and cheap to boot, this DIY jar kitchen garden is a cool, yet practical way to grow and style your kitchen herbs. Learn exactly how to make it with this three-step video or follow the steps below.... So when I saw this simple idea from Dimples & Pigtales (how cute is that name!?) for growing an “herb garden” in your very own kitchen, I couldn’t get to the store to buy seeds fast enough! 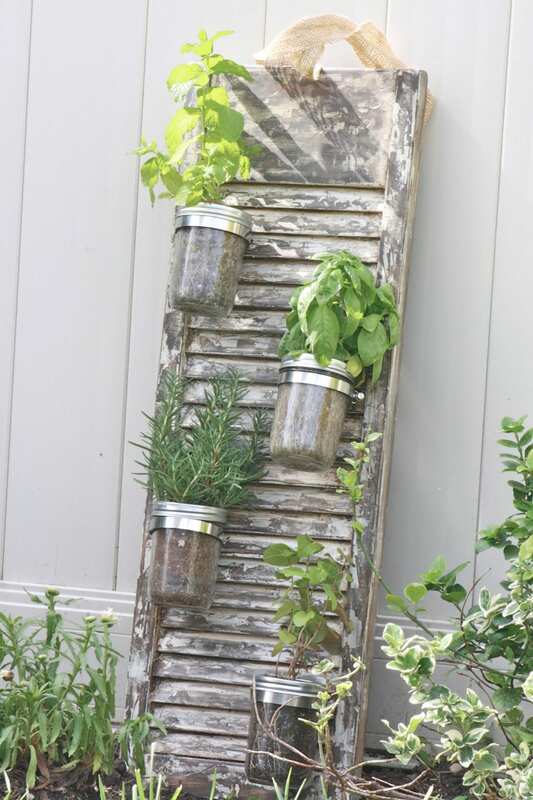 Create an herb garden with easy-to-find materials in 10 simple steps. It’s been over two weeks since my dad and I constructed a Mason jar herb garden on my kitchen wall, (which by the way was one of the best projects that I have ever done with my dad). To grow herb cuttings in water, select young, healthy, actively growing herbs with stems about six inches long. Cut them off the plant with a very sharp pair of scissors or pruners (for purchased herbs, cut off the bottom of the stem to leave a fresh, clean cut). Strip off all of the leaves from the lower two-thirds of the stem (saving them for cooking, too). But mine have started to grow green algae in the pebbles and also a little between the jar and the dirt. Is this normal? will it harm the herbs or should I be worried about using the herbs? Is this normal? will it harm the herbs or should I be worried about using the herbs?